LOVE's Haven: MM: Rain, Rain Go Away! go out and play in the rain, she will just sing to me the "ella, ella,eh-eh"
(umbrella song by rihanna). lolz! Happy Mommy Moments to all! hahaha! singer diay ni c entet.. aysa..pwd ba na mabasa iyang payong? hahaha! hahaha i love your entry, so cute! she is so adorable in her japanese umbrella! cute naman, kumakanta na! I love her Japanese umbrella! !She's so cute,Mommy Phebie! 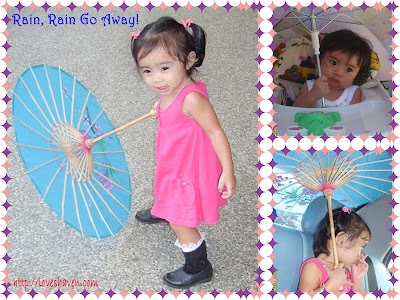 !\(^0^)/Walang Japanese umbrella ang anak ko lol!! cute song of your lil girl :-) I love the color combination of her umbrella and dress. hugs! Your daughter is cute in her Japanese umbrella. Was she inside the car on the last photo?